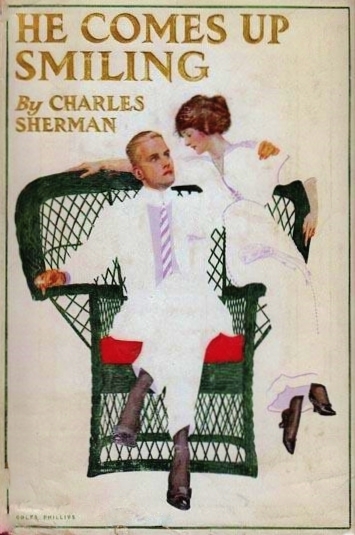 He Comes Up Smiling by Charles Sherman ~ 1912. This edition: McLeod & Allen, 1912. Hardcover. 351 pages. Light as a feather and just as fluffy was this century-old bit of humorous fiction. From the San Francisco Call, February 18, 1912 comes the following commentary. Though the reviewer for the SF Call thought this was a grand bit of fiction, I am sorry to say that it did not travel through its ten decades with a whole lot of staying power. It has merit as a literary and cultural curiosity, and the first few chapters are quite delightful, but it petered out midway through and slid gently downhill to end in a well-cushioned and in no way fatal heap, rather like a slow speed accident with one of the vintage cars which the tale is so dependent on. Three American tramps laze away a sunny summer Sunday morning, and in the course of conversation start a debate as to which of the two younger men would “clean up” better. They propose a beauty contest of sorts, to be judged by the corpulent Mike, and off go James and “Watermelon” (later found to be possessed of a proper name, Jerry, though it is as Watermelon that we follow him through his adventures) to town in search of a shave and brush-up and an upgrade in wearing apparel. Watermelon is our unlikely hero from the very start, and we follow him into a barber shop where with a clever bit of smooth talking and a pinch of sleight of hand he obtains from the barber – who forks over quite willingly, which demonstrates the magic of Watermelon’s smooth patter – not only a shave, but the contents of the till. Clothes are a bit more difficult to come by, but here luck is on Watermelon’s side, as he comes across a young man swimming in a small lake, with his elegant clothes placed neatly on the shore. Watermelon there and then “borrows” the improved apparel, hiding his own cast off garments nearby. He fully intends to come back and swap down, but he also wants to keep the naked swimmer in a position not to give pursuit once he returns to shore and realizes his predicament. Proceeding on his way, now nattily attired in stylish new clothes, Watermelon happens upon a deserted car – obviously that of the oblivious swimmer – and climbs in to relax and daydream a bit. Along comes another car, carrying an elderly gentleman and his middle-aged daughter along with their chauffeur; they impulsively offer to rescue the “stranded” young man, and Watermelon, as is his phlegmatic way, goes along with the assumption that he is an unmechanical rich man out for a jaunt. One thing leads to another, and when the time comes to make introductions, Watermelon hands over a card from the case in the borrowed suit, “revealing” himself as a certain young stock-broker who has just made a fortune on Wall Street, to great publicity. Taken off to dinner with his new friends, Watermelon is introduced to a “fellow” stock-broker and his lovely daughter, and once Watermelon sets eyes on the lovely Billy his fate is sealed. Deciding that one afternoon with this angel on earth is worthy of continuing the masquerade for at least a few hours longer – he still intends to return the clothes and make all right with the swimmer – Watermelon makes himself agreeable to all. Little does he know that Billy’s father is hatching a mildly nefarious plot to kidnap the man whom he views as a business rival, and to carry him off for a week in the depths of the country, thereby leaving the coast clear for Billy’s father’s partner to triumph on Wall Street without interference. The humour is relentless and the situations highly contrived, but Watermelon gently winkles his way into the hardest of readers’ hearts as well as that of susceptible Billy. The ending is broadly telegraphed from very early on; we fully expect to see Watermelon ‘fess up and buckle down to a life of honest toil in order to win the fair Billy’s hand. Though he does come clean, the honest toil bit doesn’t look to be in his future; the resolution is rather odd; it felt like the author cheated us of the expected rounding off of this ultra-light tale. A rather strange little reading experience, both more enjoyable than it sounds from my dismissive comments above, and less satisfying than it could have been if the author had been a bit braver with his character developments and multiple romantic interests. Definitely a throw-away sort of tale, a momentary diversion at best. Sort of a lightweight American P.G. Wodehouse of the B-list variety. 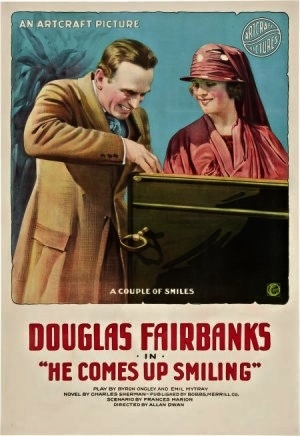 The story was made into a 1914 stage play, and then into a 1918 silent movie starring Douglas Fairbanks as Jerry Martin (the “Watermelon” of the book), though the plot was gingered up to make it more conventionally dramatic.